Good Morning Readers! Long time no see is an understatement, to say the least. Being an evening law student is incredibly difficult with working full-time and going to classes, you have to have perfect time management that being said I also had to prioritize and unfortunately Legally Foreign fell on the back-burner of priorities. However, it is summer time and I am finished taking summer classes, I do have a little more time on my hands and I can start blogging again!! YAYYY! During my first year of law school, I can definitely say I have never worked so hard for a degree in my life. It seemed like in undergrad, I would do just enough to pass my class and get that A but now I have to spend a lot of time preparing and making sure I understand the material and still not getting the grades that I want. All the reading, time management, tears, studying, cold calls, long hours I put in this past year has been both stressful but also rewarding. Yes, law school is hard but it is also MANAGABLE. Law school is hard because you have alot less free time and you actually have to do the work and put in the hours to get the grades you want. I still manage to do my crafting hobbies and go out with friends when I get a second to breathe. 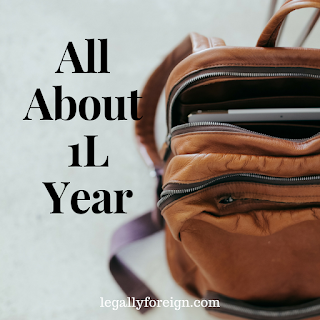 My first year was a few highs and a lot of lows. Everything was new and exciting the first semester, trying to find new friends, navigate through law school, trying to get good grades, trying to beat the dreaded curve... I joined the Black Law Student Association (BLSA) (Look out for a post on BLSA) and became the 1L representative and although the position was easy to manage because it was low commitment it was still another thing on top of what I was already doing. During the fall semester, I had to learn to adjust to all the reading, the new way law school forces you to think, the stress of getting good grades, and also my grandfather who I am very close with had a stroke. I started to go off the deep end a little bit worrying about my grandfather's stroke and missing a week on classes to go to Florida to go see him. This was his third stroke and I was afraid that he was not going to fight through it this time. I am happy to report that he is doing better but we did have a scare. I got through the study period (S H O U T O U T to my friends who are also in my study group) and got through my first set of finals which, were stressful. During one of my finals, my computer crashed and I had to run out mid- exam to tech support to try to salvage what was left of my exam. Unfortunately, my grade suffered because of it. I was crushed because I felt like a failure. I worked so hard all semester and because of a computer failure, I was stuck with a bad grade. In undergrad, I was used to getting straight A's but law school is a completely different ball game. Second Semester, I came back refreshed and ready to GRIND it out. I was taking 4 classes and I was learning that a lot of the areas of law overlap and what you learn in other classes (if you paid attention) prove to be helpful later on. I was doing all of my reading and going to class then my uncle who I was close with was killed. Yes, you read that right! I felt like my life was over. I had just saw him a few weeks before and now he was gone. That was a HUGE set back as I had to take time to go back to my home to deal with everything that was going on. I fell into a depressive state and really did not want to do anything but stay home. I could not understand what would possess someone to kill another human being. This was a very hard time for me to learn to forgive, let go, and move on. Nothing ever happens like that in our small home town and if it does we weren't to aware of it because it wasn't happening to us. I was so overwhelmed. I thought about dropping out (look forward to a post on this) and/or switching to full- time so that I could finish faster and move back to my family (look forward to this in another post). I felt so much guilt for not being home. When my uncle passed, I was not there. When my brother got his braces, I was not there. When he started his first day of high school. When my sister had graduated out of her summer camp. I miss being able to share special moments with my family. It is so hard but I digress. After coming back from my uncle's funeral and getting back into the swing of classes, my fellow section mates welcomed me back and were so supportive. It made me realize that we are a little family. Even though we are competing with each other for grades, or we disagree with one another, and we might not all like each other all the time..... We are all going through this law school journey together. Looking forward, I still work, still go to law school, am the secretary and historian for BLSA, and am a notetaker for two of classes this upcoming semester....... How am I going to do it all? If there is anything I learning about law school is to take it one day at a time and you will get through it by taking it one day at a time. I’m so sorry for your loss. It must’ve been a challenge getting through that first year with everything that you had going on. Thank you for sharing this because it’s inspiring. If you can make it through 1L year while dealing with all of that, then I know I’m capable of of doing the same! Thank you so much for reading! Yes! it was very challenging but I know if I could do it with all that was going on then I know you can too!